This time of year always seems to be so crazy around here. I always think I have more time than I do and always over extend myself. I love helping with all the holidays and parties and almost always sign up to make treats for everything. Sometimes I have a go-to recipe, and sometimes I don’t. Sometimes I’m running to the store the night before pulling my hair out trying to figure out what I’m going to make still. 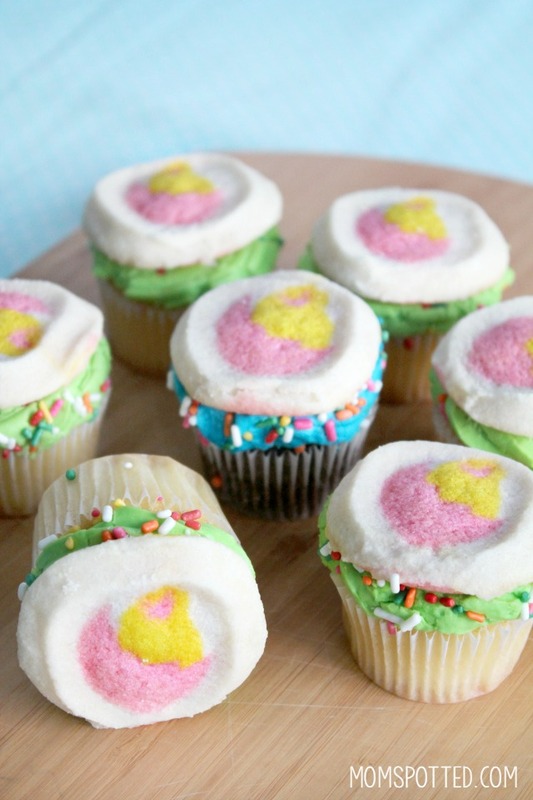 These Baby Chick Cookie Cupcakes will rescue you from that. The are fast, easy, and something your child is still excited to bring in and say they helped make. 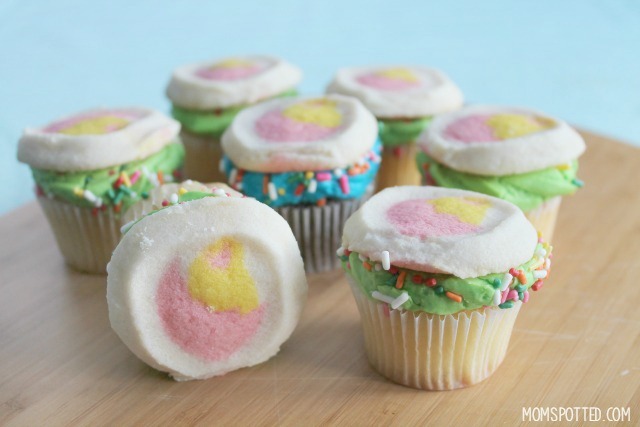 There are many ways to cheat at “homemade.” These Baby Chick Cookie Cupcakes are a perfect example of that. 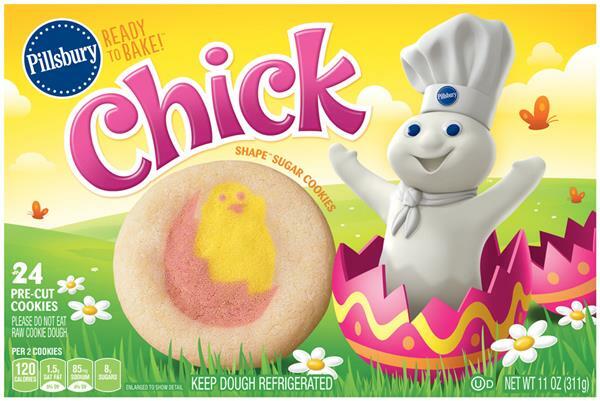 I start with grabbing some Pillsbury Chick Shape Sugar Cookies. There are twenty-four cookies in a package, so there’s usually enough to snack on too. They come ready to go, just place them on a baking sheet and they just take 10-12 minutes to bake. Let them cool completely. The hardest part will be fighting everyone from stealing them. We get Pillsbury Shape Sugar Cookies all the time because of how fast and convenient they are. To make things even easier, I bought store bought mini cupcakes but making them from the box works too. Pillsbury has lots of great flavored cake mixes. I chose mini cupcakes because they were the same size as the cookies. All you have to do is squish your cookie down on top. If your frosting is a little stiff just place them in the microwave for about 15 seconds or apply a dab of frosting (any color) to the back of the cookie. The additional frosting will act as glue. These were frosted fresh the day I bought them at Walmart, and my frosting was perfect. We also added extra rainbow sprinkles around the edges of the frosting. How cute are these? They’d look great on any Easter dessert table, but we thought they’d make great treats for the preschool to celebrate the baby chicks in the classroom. 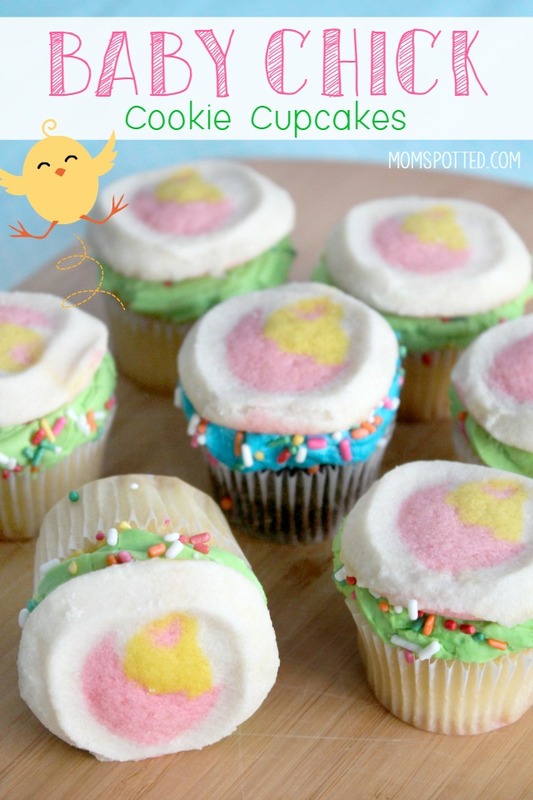 Kids just love knowing that they get both a cookie and a cupcake with these Baby Chick Cookie Cupcakes. 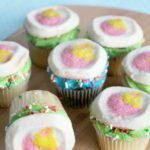 These Baby Chick Cookie Cupcakes are a cute, fun addition to any Easter dessert table or fun springtime party. They make great preschool snacks too! Press cookies down onto the frosted cupcakes. Add additional rainbow sprinkles to the frosting edges. Walmart has lots of great recipe ideas for your Easter gatherings. To find your favorite sweet or savory ideas visit Walmart’s Everyday Recipes website. I think these are cute. I also like how you get a cookie and a cupcake- now thats a win! Those cookies that have the designs in them make things easy and I dont consider it cheating at all. What an adorable idea! Its a double treat too! That is such a clever way of making fun cupcakes without a lot of work. 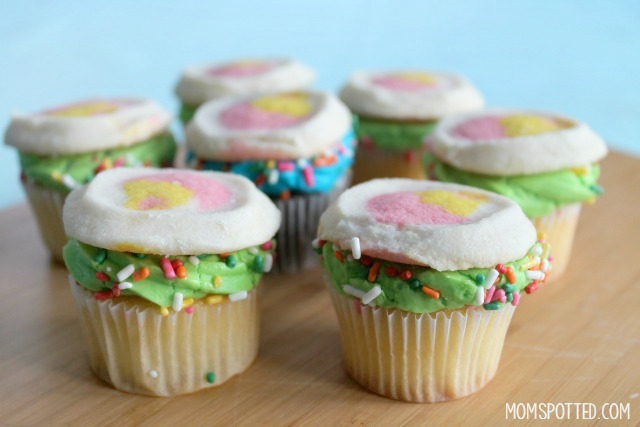 What a wonderful easy idea for decorating cupcakes. My grandchildren will love these. 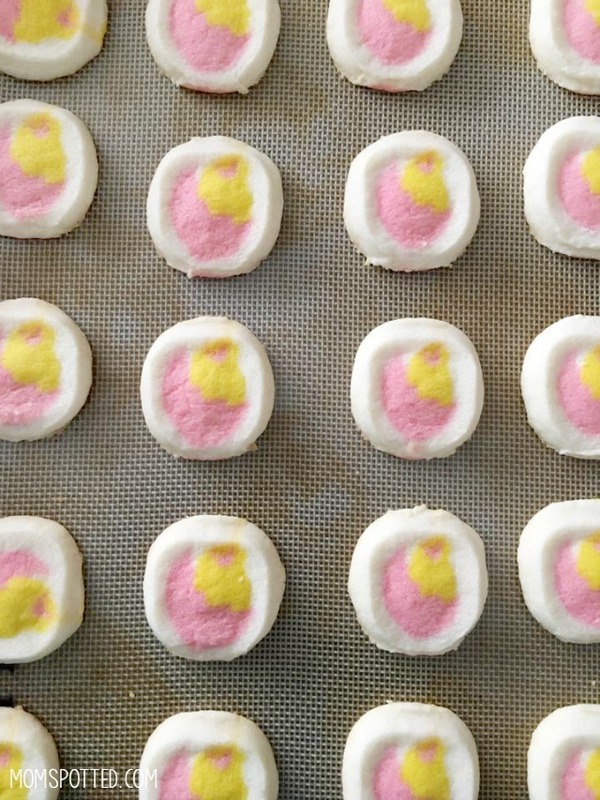 I can see me making these for all occasions just with different Pillsbury cookies on top. this is such a cute idea. You get cookies and a cupcake. Double fun. Thank you for the idea. So cute and nicely decorated. These are extremely cute cupcakes. These are adorably cute cookies love to eat fun desserts that look great too. 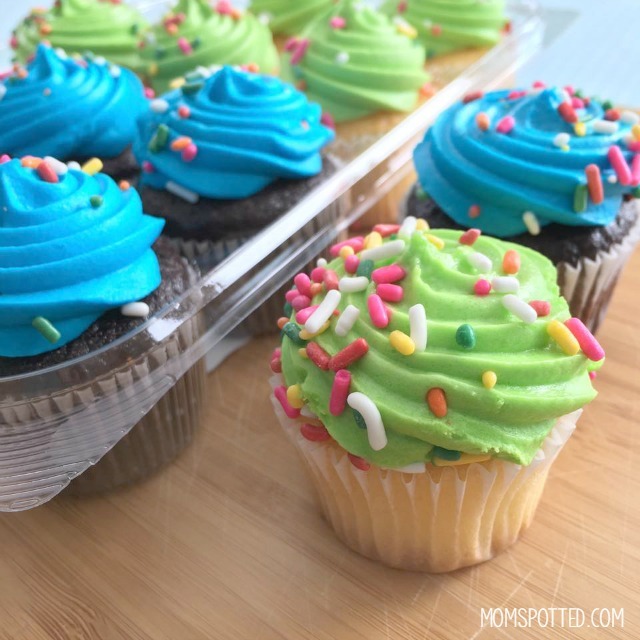 I love the color of blue that you have made for those blue frosted cupcakes-beautiful!